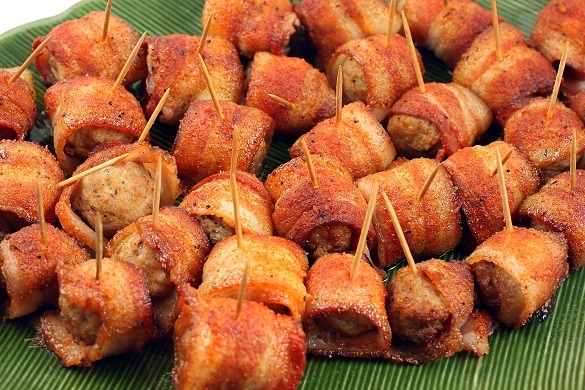 Moink balls are sure conversation starters that are tasty and fun to make during your parties. 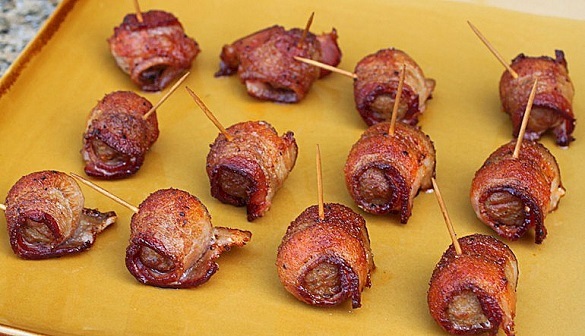 The “moo” comes from the beef ball and the “oink” comes from the bacon. To make it easier on yourself, get a bag of cooked frozen beef balls. Of all the meatballs I’ve tested, the best one for moink balls is a $5.00 bag from Walmart. Look for the Great Value package of meatballs in the Walmart frozen section. While you’re there, get two packs of Great Value thin bacon and a pack of toothpicks. Semi-thaw the meatball and wrap it with bacon and hold in place with a toothpick and dust with some SYD BBQ rub. Sprinkle some cayenne pepper if you like your moinks spicy. Remove when bacon becomes crisp and drizzle with some maple syrup or your favorite sweet BBQ sauce to have some sweet to balance the salty bacon. A $5.00 bag of meatballs makes enough appetizers for about 10 persons. A great yield if you’re doing catering. These sound fun to try. Two questions for you. First, since the meatballs are frozen, do you thaw them first? (I’m assuming "yes" since you have to put a toothpick through it, but wanted to check). Second, approximately how long before the bacon becomes crisp at 300 degrees? Just leave in fridge overnight to soften before assembling. Bacon is cooked in about 30-40 mins depending how far it is from the fire. OK to cook in oven also. I tried these at the CBBQA Q-fest and loved them. Can’t believe they’re so easy to make. I highly recommend these. Tried these tonight with the kids, they LOVED ‘EM! Made a few that were also coated with brown sugar, went awesome with maple syrup as a dipping sauce. Very sweet on the front, then finish with a little heat from the BBQ rub and cayenne! Give it a shot and I think you’ll be convinced! I made these with my 12-year old son for a cookout and they were everybody’s favorite! Very easy to make. Make twice as much as you think you’ll need because they’ll disappear in a flash! These sound yummy Harry! Thanks and all the best!